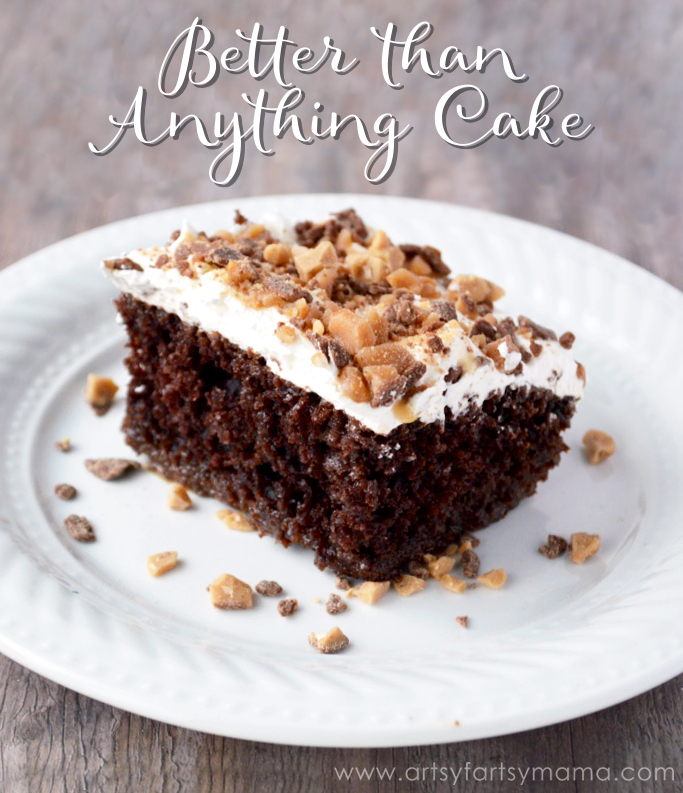 If you're looking for a dessert that is incredibly simple to make and tastes better than, well, almost anything - you've got to try this cake! Chocolate cake covered in whipped cream, drizzled with caramel, and topped with toffee, it is something everyone is sure to love. My sister has always requested this cake for her birthday, so I'm always reminded of her when we cook up this recipe. Make cake as directed on box for 13x9 inch pan. Cool for about 10 minutes. Poke top of warm cake every 1/2 inch with handle end of wooden spoon. Drizzle entire can of condensed milk evenly over top of cake. Cover and refrigerate for at least 2 hours until chilled. Can also be refrigerated overnight. Spread whipped topping over top of cake. Sprinkle generously with toffee bits. Serve cold. Store covered in refrigerator.